First, know how much you are worth. This doesn’t necessarily mean your last salary; check out different salary sites to learn how much professionals with similar years of experience are making in your city or region. Also reach out to your mentor and network to see if they have solid information about what you should look for. During the negotiation process, make sure you stay enthusiastic about the offer and remain confident about your asking price. Your employer will be more willing to budge if he/she sees you’re excited. Salary negotiation is a business transaction, so you should check your pride, anxiety and other emotions at the door. Just stay professional, enthusiastic and confident. If your salary number isn’t exactly where you’d like to see it, remember that there are other benefits to sweeten the deal. See if there are options for gym memberships, commute reimbursement, more PTO/vacation time, work-from-home days and other benefits. Things like this can more than make up for a slightly lower salary. Salary negotiations can be an incredibly nerve-wracking experience, but it’s certainly one hurdle you will be grateful you faced! Have an additional salary negotiation tip to share? Leave a comment! 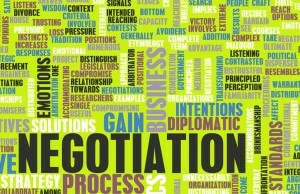 This entry was posted in Job Seekers and tagged benefits negotiation, job offer, job offer negotiation, salary negotiation. Bookmark the permalink.